TESLA AND SPACEX CEO, Elon Musk showed a demonstration of AN idea FOR COMMUTING, on stage, at a space industry conference, claiming that HIS IDEA will allow passengers to take “most long-distance trips” in just 30 minutes and go “anywhere on Earth in under an hour” for around the same price as an economy airline ticket. Proposed routes include: Hong Kong to Singapore in 22 minutes, London to Dubai in 29 minutes, London to New York in 29 minutes and Los Angeles to Toronto in 24 minutes. Passengers would take a large boat from a dock in a city to a floating launchpad out in the OCEAN. FROM There, they WOULD board the same rocket that Musk wants to use to send humans to Mars by 2024. But instead of heading off to another planeT once they leave the Earth’s atmosphere, the ship WOULD separate and break off towards another city. This city-to-city travel would be, by far, the fastest ever created by humanity. We’ve all been there: your idea is so great that you’re literally bursting at the seams wanting to launch it as soon as you can (maybe even today). Like Elon Musk, he proposes city-to-city travel by rocket, right here on Earth, most of us feed on this excitement. 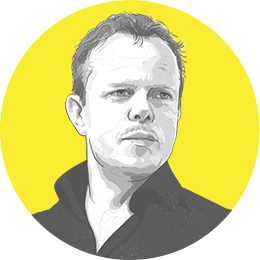 But how do you know you’re making the right bet with your idea? What bet is the success of your idea depending on? These are your riskiest assumptions; they need to be tested. Whether you work for a small startup or an existing large organization, validate your riskiest assumptions as quickly and cheaply as possible so you don’t waste valuable time and resources toiling away at something that likely will never work. But this is often harder than it sounds. How might you find your riskiest assumption? Most people know the game, Jenga. It’s a game where player, in turn, try to remove blocks from a wooden tower. Each block that’s pulled out may make the tower collapse, but the blocks on the bottom are critical to keeping the tower upright. Think of your idea as a big Jenga tower, where all of the blocks are assumptions. When one of the assumptions on the bottom of the stack is invalidated and the block is removed, the entire tower may fall. Alternatively, when you remove one from the top, likely not much will happen. After all, if the riskiest assumption is incorrect, it may be totally irrelevant to think about any of the others. To identify the assumptions you’ve made about your business, have a look at other business/strategy canvases you’ve created, such as your Value Proposition Designer, Business Model Canvas, Vision Canvas, Customer Journey, Persona, and Design Criteria. Each of these canvases contains untested assumptions. What are your assumptions? What are the things you’re not sure about? 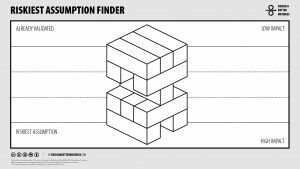 Use this template to map them on a wall with your team as a Jenga tower. The ones that absolutely must be true for your idea to work go on the bottom of the stack. With your team in place, use your designer’s tools (sticky notes, markers, and a big wall) to rank these, based on which you could not do without or which are most likely to be false. The sooner you find these, the more likely you are to be able to validate them and either move forward or pivot. Above you can see the riskiest assumption for SpaceX: Business people will use rockets instead of airplanes to fly to their destination. As you can see, this assumption is placed on the bottom of the Jenga tower. If this assumption is not right, it may be irrelevant to think about any of the others. The other assumptions are related to the riskiest assumption. Almost as important as the riskiest assumption is the one also on the bottom: ‘Business people are not afraid to travel with a rocket’. If this assumption is invalid, and business people are indeed afraid of traveling via rocket, the Jenga tower falls. 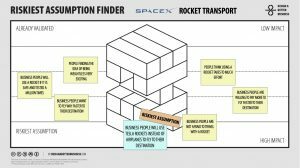 Another assumption with a high impact is the one about the price of rocket transport. Are people willing to pay more to fly to their destination? And, do they want to fly faster than they do now, or are they satisfied with traveling by plane? If the riskiest assumption is right, you can move to the next riskiest assumption, and so on. Finding the riskiest assumption is not always easy. Discussing assumptions with your team will help to identify the ones to go after. Do this visually so it’s to the point and provides you with the outcome you need! The goal is to try to make the tower fail fast! So pick the bottom-most assumption, with is the riskiest one. That’s what you’ll want to know more about. If it is right, you can move to the next riskiest assumption. But if it fails, you Jenga tower falls, and you’ll need to go back to the drawing board to find another approach that works better. In our next blog we will explain how to use the Experiment Canvas, which will provide a straightforward way to break down your assumptions into measurable and observable experiments. What do you think, are we using rockets instead of airplanes in a couple of years? Want to use the Riskiest Assumption Canvas? Use the step by step guide and download the canvas. Can we help you with designing a better business? We are more than willing to help! Like these tools? You can experience ‘Design a Better Business’ live! Feel the uncertainty in your bones as we take you on a design journey. Experience and learn what it means to think and work like a designer. Check our upcoming events in New York City and in Amsterdam. I WANT TO EXPERIENCE IT LIVE!